The recipe below calls for using a white cake mix and ready-to-spread frosting but you can make most any homemade 2-layer cake if preferred. 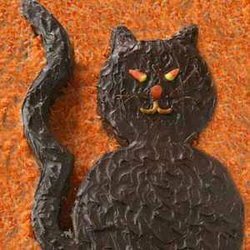 If making your own frosting it is best to use a chocolate frosting to make it easier to achieve a good black color when adding the black food coloring. Prepare the cake mix as directed on the package for two round 8 or 9-in cake layers. Prepare pans as directed on the cake mix. Bake, cook, and remove the baked cakes from the pans as directed. Cool completely on a wire rack. FIND THE CAKE TEMPLATE HERE. Mark a circle around one of the cake layers about 1 inch in from cake edge as shown in template. Cut at marking. Remove inner circle and place on large platter, cake board, or baking sheet. This will be the cat's head. Place the other full cake layer under the head to make the cat's body. Cut cat tail, ears, and feet from remaining 1-inch outer circle as shown in template and arrange as shown on body of cat. Mix food color into frosting, using about 3 to 4 drops food color for every 1/2 cup frosting. Frost cat head and body. Frost tail, ears and feet; attach to cat head and body with frosting. Use candy and pretzels to make cat's eyes, nose and tongue. Allow frosting to set up a little and then cover lightly and store at room temperature.